Still sick but now on heavy antibiotics, so there is hope. This is Earl, he spends most of his time drinking coffee and looking for his keys. I sent him to my goddessmother for her birthday and apparently her friends thought he was hilarious, even more so when they realized he was anatomically correct. 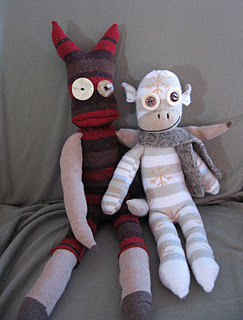 Unnamed sock monster (Christmas present for nephew) and the winter solstice monkey. Playing around with construction techniques, I combined the ease of this book with the quirkiness of this book to create the monster. Sure she looks sweet and adorable and she is, but she has a sassy side too. She likes tea parties but she LOVES beer and dancing all night long. Created for a swap with Miz. Monica, had so much fun decided to teach it at summer art camp! 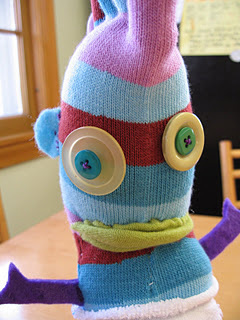 Sid, a sock monkey with attitude. Created for a friend for her birthday. Another shot of the Love Bugs. 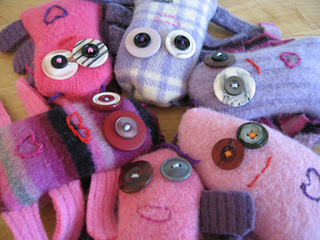 These little guys are made from recycled wool and filled with flax and lavender. This batch went over to I Like You in So. Minneapolis. 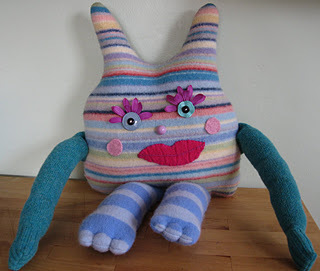 My kids loved them so much, I made one for each of them for Valentine's Day. February 29, 2008 by carol strand.